The Bronx Cocktail is a light and simple drink, something you might serve as a luncheon cocktail, or even a brunch cocktail, if you’re looking for something more assertive than the usual Mimosas and Bellinis to launch you into the noonday sunshine. The usually accepted story of the Bronx is that it was invented as just such a lunchtime thirst quencher by Johnnie Solon at the Big Brass Rail barroom at New York City’s Waldorf Hotel. (That was before they built the Empire State Building on the site.) It appeared in William Boothby’s 1908 The World’s Drinks and How to Mix Them , and quickly achieved cocktail celebrity status—by the end of Prohibition, only the Martini and the Manhattan were more popular than the Bronx. It was a handy recipe to know in a culture that had lots of dodgy gin, and lots of orange juice to cover it up. Despite its early popularity, the Bronx faded, then fell completely from sight in the decades since WWII. Such was the fate of vermouth-laden cocktails in the second half of the 20th Century. 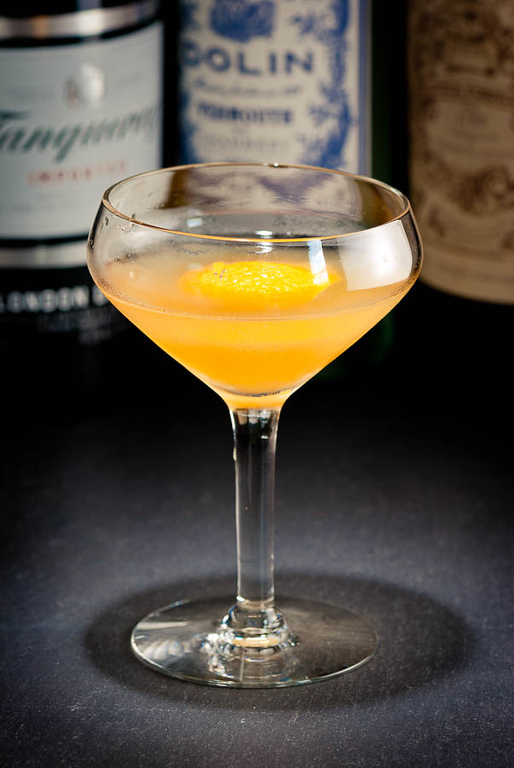 The Bronx is often described as a Perfect Martini with orange juice. Recipes are all over the map; the amount of orange juice, for example, ranges from an ounce of orange juice per drink all the way down to just a spoonful. There is even something called the “Bronx Cocktail—No. 2” in Gale and Marco’s The How and When (1940) that contains no orange juice at all, only an orange twist. We’re pretty much back to the Perfect Martini again with that one. Shake all with ice until cold; strain into a chilled cocktail stem. Express and garnish with orange twist. The Bronx works best with juniper-forward gins like Tanqueray or Bombay Dry; an experiment with the lighter Boodles went well, though the orange juice dominated the drink. If you enjoy less “junipery” gins, it would certainly be worthwhile to tune this drink for your specific favorite. Regan’s formula suggests the quarter-ounce measures of the vermouths. I prefer the half-ounce portion, but that is going to be driven by the sweetness of your oranges, and by the vermouths you have on hand. The vermouth is definitely the “tuning” ingredient in the Bronx. Still have some oranges on hand? Coming up next: Satan’s Whiskers. “The Bronx Cocktail” at cold-glass.com : All text and photos © 2011 Douglas M. Ford. All rights reserved. Looking good right about now — is it a problem that it’s only 10:30 a.m. here? Obsessed. I’ve known that there is a cocktail for each boro but yet to try them all. I am in love with your recipe and pic so you’ve inspired me to write a quick blog post about them. Used your pic and gave credit. Keep up the good work! Yes, New York barmen do seem to love the idea of naming drinks after their neighborhoods. I’ve tried quite a few of them, and some are, shall we say, more attractive than others. But I still have a way to go on my Tour de Boroughs. I’m glad you enjoyed the Bronx; thanks for the credit in your posting. It seems a great drink. I will try it some time. It looks a little bit like egg yoke but I’ll try anything once! Egg yolk, very amusing. I had a similar thought, actually… That’s one of the hazards of orange twist garnishes, I guess. Perhaps I’ll style that garnish differently in the future. Enjoy your Bronx! It sounds kinda like a cross between a left handed screwdriver and a martini. It sounds interesting. looks scrumptious! did i mention it’s 4:28am in tokyo right now? Can’t wait to try this! I could definitely use a stiff drink tonight. Yeah, there’s that orange garnish again. The floating rounds look good in “real life,” but I’ll have to stick to other shapes for the photos. I am working on a blog about the essential liquers every twentysomething should have in their pantry and I was wondering if you could suggest anything? Perhaps some that are used in many cocktails? Depends on what you want to do with that pantry. If your tastes range more widely, or if you entertain friends with diverse preferences, you’ll need to devote more pantry space to the project. The basic generalist’s pantry would likely include your favorite vodka, gin, bourbon, and rum, plus sweet and dry vermouths, and angostura bitters. Perhaps some Cointreau. And of course, lots regular grocery items, like fruits, lots of ice, and soda, cola, and/or ginger ale. Have you checked out David Solmonson’s 12 Bottle Bar? (You can click to him from the Blogroll link in the sidebar.) He is making a disciplined (and successful) attempt to maintain a minimalist back bar—yes, 12 bottles—and his description of his philosophy and choices may guide your thoughts. Ooo I wish I had known about this cocktail back when I was in a bronx high school. Umm not that anyone under 21 should drink. Great post! I’m glad you enjoyed the post. There will be more, follow! Cocktail with a side of history, gotta love it! All the great cocktails (and some of the not-so-great) do seem to have a story. Or two. And not necessarily true, but always entertaining. I’m head barman at a jazz lounge in Colorado, and I’ve recently begun making Bronx cocktails with Oxley, the botanicals of which combine in a surprisingly pleasant way with the OJ and the orange bitters. I haven’t encountered Oxley here in beautiful Minnesota. If I get a chance, I’ll try your recommendation. Thanks. Love this!! And I don’t even care its in the middle of the week and the weekend is still 2 lifetimes away…lol. Love your blog!!! Have subscribed!! I’m glad you enjoyed it, thanks for subscribing. If it turns out you like the Bronx, then be sure to try Satan’s Whiskers. So many cocktails, so many stories. I’m delighted that you found Cold Glass. And hey, your blog shows you to be a careful and detail-oriented cook, so you’ll have no problem with making cocktails. Have fun! This looks delicious and love the story. Thanks! yummy! craving for 1 right now in the middle of a hot afternoon! I think a Bronx (or two) would be just the thing on a hot afternoon. Excellent. Well this is one I HAVE to try – Gin is, and always has been my tipple of choice! and anything with Gin in it goes down well with me. I am bored with serving Bucks Fizz, Mimosas, Bellini’s (and/or Pimms in summer) so the Bronx looks right up my street!. My one question is about the orange bitters – as an ex-Londoner now living in Beijing, I am not familiar with these, the only bitters I know of are Angostura Bitters (used for making a Pink Gin). How commonly available are orange bitters? Could I substitute Angostura or would that wreak havoc with the cocktail? BTW the nickname for Gin in the UK is ‘Mother’s Ruin’ but my (now adult) kids rebranded during the Iraq war – now it is referred to as ‘Weapon of Ma’s Destruction’ – corny joke! I’m glad the Bronx catches your imagination; yes, it does make a nice warm weather drink. Angostura aromatic bitters would not be your friend in the Bronx. I tried this experiment once, accidentally (note to self: don’t forget which cocktail you’re making…), and I can tell you from experience that aromatic bitters have no place in this drink, no. Much better to leave the bitters out altogether. The drink is acceptable without orange bitters, brilliant with. Orange bitters were a nearly defunct ingredient until a few years ago; the cocktailian movement and a rising interest in the classics has returned them to the US market, where there are now at least a half-dozen brands readily available. Alas! I have no idea if you can get such things in Beijing. It would be interesting to learn if there are locally produced products that are, in essence, orange bitters? It’s an intriguing line of inquiry, since the Chinese culture is more in tune with herbal medicines than seems generally true in western countries. I do know that Fee Brothers and Bitter Truth make excellent orange bitters that are available in the UK, and I believe that the Angostura Orange is available there also. Perhaps you have friends coming to visit soon? I’m glad you found Cold Glass; thank you for taking the time to comment. It looks delicious and very well may be my perfect martini. I’ll have to give it a try this weekend. Thank you for the recipe and the info on the gin options. Cheers! I hope you enjoy it, thanks. looks good to me! I’ll try it. This is marvelous! I shall have to subtitle it “Buster Bronx” in honor of my father as it has some of his favorite ingredients. Totally true about the fresh squeezed oranges! Thanks for sharing! Amazing, I am going to try it right away! looks like a raw egg! The Bronx is a pretty famous cocktail; I imagine that, barring some sort of silly neighborhood politics, any skilled barman would be able to provide a decent version. On the other hand—I’d go get the vermouth, too. They always taste better at home. Love this! ;-) Keep up the good work and ill keep following you!! Wow….. It looks very delicious.. can’t wait to try It! WATF – Happy National Martini Day! | whyallthefuss?